Betsy Ross would have been proud of Kayla Dominique’s ingenuity and patriotism. Kayla, a resident of Cement City, Mich., needed to install a nonflammable barrier behind her wood stove. However, building a stone wall was cost-prohibitive. That’s when Kayla got creative and put her coin collection to good use. 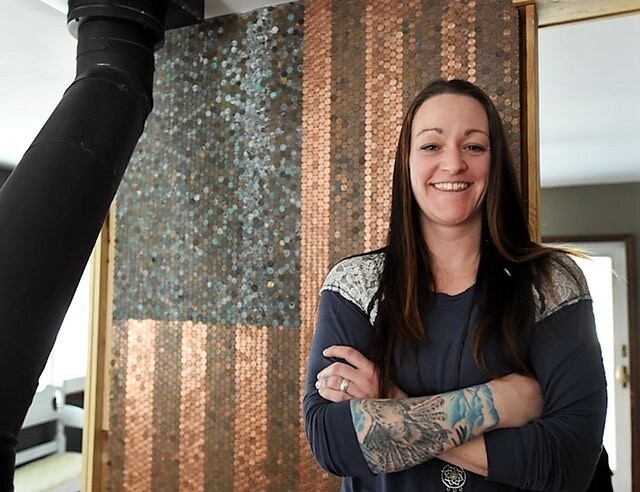 Three years ago, Kayla began this project in her basement, where she sorted through thousands of multi-hued pennies and glued them to a large board. Kayla used brand new pennies to represent the white stripes and older pennies for the red stripes. For the blue area of the flag, Kayla used pennies that had oxidized and changed to a bluish color. Kayla and her husband, Levi, eventually moved the flag-in-progress to their living room wall, where they finished the project in January 2019. The completed flag includes 7,700 pennies, each with its own unique story. Although the flag wall has become a treasured centerpiece of the Dominique’s living room, Kayla and Levi are thinking of moving it to a bar/restaurant they hope to open one day. “It would be cool to display this flag in our bar and share it with many other people,” said Kayla, who is already thinking of using blue pennies for another creative project. Wherever Kayla’s flag wall is displayed, she is proud to show her love for her country.